This 15.6in notebook is quick and has plenty of useful features. 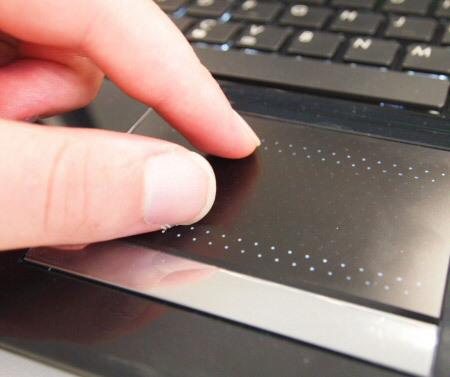 In particular, we love its multitouch touchpad. The ASUS U50Vg would make a great desktop replacement, but it's also capable of being transported to work or school and its battery life is quite good. The ASUS U50Vg notebook is like a 15.6in portable reflecting pool — but without the benefit of ripples. It has an all-over gloss that reflects any lights within its vicinity and you can see yourself in its screen and chassis when you use it, which can be distracting. It has a backlit keyboard so that you can type in the dark, but, most interestingly, there are lights in the touchpad that follow every vertical movement your finger makes. There's no doubt that the ASUS U50Vg will stand out, whether you use it at school or on the road. However, due to its size, you won't be able to use it comfortably while riding public transport. Its weighs 2.6kg (not including the power adapter), which is actually not too bad for a 15.6in notebook. However, its dimensions make it difficult to pack the unit with its large power adapter — you'll need a decent sized bag to fit it all in. We carried it around in a small backpack while commuting and found it to be relatively easy to get around with, but you wouldn't want to do it every day. You can use the ASUS U50Vg away from an outlet for a decent period of time. With its 6-cell battery, the U50Vg lasted 2hr 44min in our video rundown test, in which we loop an Xvid-encoded video with the screen at maximum brightness, power management disabled and the wireless radio enabled. You can change power schemes on the fly by pressing the button opposite the power button on the bezel, so you can get even more life out of the notebook. Our review unit was equipped with a 2.53GHz Intel Core 2 Duo P8700 CPU, 2GB of DDR2 SDRAM, a 500GB, 5400rpm hard drive and an NVIDIA GeForce G105M graphics adapter (different configurations are available). This configuration produced times of 1min 12sec and 1min 08sec in the Blender 3D rendering and iTunes MP3 encoding tests; these are fast times and indicate that the U50Vg can be used comfortably for most multimedia tasks. You'll be able to manipulate high resolution photos and even edit videos on this notebook, and it has plenty of hard drive space for large files. The hard drive is slow, however. It only averaged 21 megabytes per second in our transfer tests — but you can plug in a fast external SATA drive if you do plan to use the notebook for disk-intensive tasks such as video editing. Along with the eSATA port, there are other modern conveniences on the U50Vg, such as HDMI and an ExpressCard/34 slot. You also get 802.11n wireless networking, Gigabit Ethernet and Bluetooth 2.1 EDR, so it's a well-equipped notebook. It also has a built-in DVD burner, an SD card reader, a VGA port and a webcam. The panel on the bottom of the U50Vg can be easily removed, letting you access the hard drive and RAM compartments. The hard drive has a SATA interface and there is a spare SO-DIMM slot so you can add another 2GB of RAM. You won't be able to play many games using the ASUS U50Vg. Its GeForce G105M graphics adapter is slow when it comes to real-time 3D rendering, and this was shown by its 3DMark06 score of 1704. High-definition video content, on the other hand, can be displayed on the U50Vg without any problems, and its screen is vibrant enough to allow you to enjoy movies; you will have to adjust the screen in order to get a clear picture as its vertical viewing angles are very narrow. The chassis of the U50Vg is rigid and its hinges are study enough to hold the large screen perfectly in place. The chiclet-style keyboard includes a number pad — albeit a squished one — which is handy if you frequently perform calculations. The keys rattle a little when you press them, and they are not as tactile as we would like; the keyboard also bounces a little. The keyboard's backlight is very handy when typing at night if you don't want to switch on a room light. Unfortunately, there is no automatic trigger for this backlight; you have to switch it on and off manually. There are three levels of brightness you can select from. An ambient light sensor can automatically dim and brighten the screen depending on how well-lit the room is. We found the touchpad to be brilliant! It's big and it supports multitouch gestures. You can easily zoom in and out of photos with a pinching motion, and rotating photos is also a cinch; you can scroll through long Web pages simply by dragging two fingers down the pad. It feels very smooth, and you can be bedazzled by the pad's lights as you drag your finger up and down. However, the touchpad's buttons are joined together and are too stiff to press comfortably. We would prefer them to be separate and softer. The lights don't have a particular function, other than to show you where your finders are currently applying pressure on the pad. 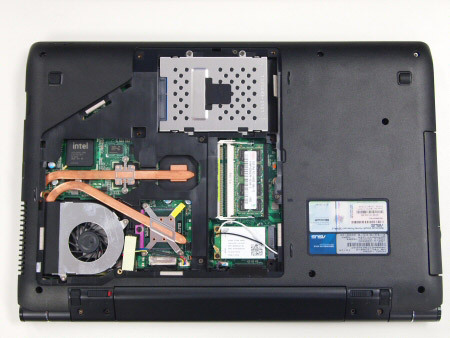 The ASUS U50Vg includes Express Gate, which allows you to boot into a Linux-based operating system that resides on a chip on the motherboard. It's an alternative to booting into Windows when all you want to do is just browse the Web, for example, and it takes less than 10sec to load. The notebook's price tag of $1699 is a little high if you've become used to checking out sub-$1000 laptops in the stores, but the extra money you pay for this model ensures you get good performance, plenty of features, good build quality and some room for expansion. Of course, we would have liked 4GB of RAM for the price, but overall we're happy with the value this model provides (including a two-year global warranty).